Submitted by mark on Thursday, May 3rd, 2018 at 3:27 pm. The news is all good for fans of the delicious espresso and stunning bay views of the Pompallier Mission Coffee House. Winter fare on offer now at Pompallier Mission’s coffee house. 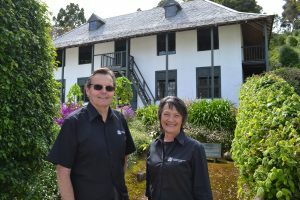 The French-themed eatery – which is part of the historic printery cared for by Heritage New Zealand Pouhere Taonga – will remain operating throughout winter by popular demand. 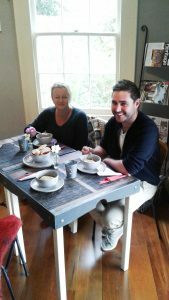 The coffee house has become a favourite of Russell locals as well as visitors to the Bay of Islands, and will open between the hours of 11am and 3pm every day offering the perfect range of French-themed light lunches for winter. “We’re delighted to be able to extend our service throughout winter, and look forward to providing such delicacies as French Onion soup and Leek and Potato soup, as well as savoury French tarts,” says the Manager of Pompallier Mission, Scott Elliffe. The historic Pompallier Mission printery building will be fitted with a fire sprinkler system during winter and will be closed to the public while that work is being done (June through August). The coffee house, however, will remain open during this time. The new winter hours will take place from Tuesday May 1. Due to the intimate space in the coffee house lunch bookings are recommended – Ph 09-403-9015. Submitted by mark on Wednesday, December 21st, 2016 at 4:25 pm. Every Christmas, Pompallier Mission and New Zealand’s oldest church, Russell’s Christ Church, come together to host community carols for locals and visitors alike. Local groups and soloists will perform traditional festive favourites as well as modern Christmas songs as part of the show, which takes place on Thursday December 22 at 6pm. People are invited to bring a picnic and a rug, join in or just kick back and enjoy. Submitted by mark on Wednesday, December 21st, 2016 at 5:04 pm. 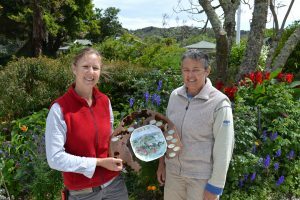 The gardens at Pompallier Mission – the historic property in Russell cared for by Heritage New Zealand – have received official recognition. Pompallier Mission has won the Russell Business Association Best Commercial Garden Award for 2016. The gardens are the result of hard work by gardeners Chelsea Neustroski and Shelley Arlidge. “It’s really nice to have this acknowledgement – especially from the local community,” says Chelsea, who is Pompallier Mission’s Head Gardener. Submitted by mark on Thursday, October 27th, 2016 at 9:46 pm. Restoration work on Pompallier Mission’s timber and plaster has been given the green light following a hugely successful donations campaign. “Thanks to the hundreds of people who have sent in donations, I can now book in the contractors and get the work scheduled,” says Property Manager Scott Elliffe. 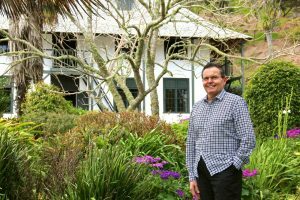 “This is a great outcome for heritage, culture and tourism in the Bay of Islands and especially for Pompallier Mission. This work will ensure it continues to be an attraction for locals and visitors, making their experiences here that much better while giving the local economy a boost. Submitted by mark on Friday, March 4th, 2016 at 5:37 pm. 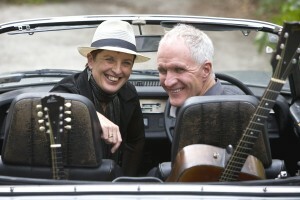 Mark Laurent and Brenda Liddiard, who will be performing at Pompallier Mission on March 11. (Photo: Paul Restall). 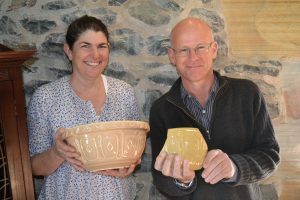 "A leading New Zealand folk duo will play a one-off concert in the grounds of Pompallier Mission on March 11 (6pm onwards)." "Mark Laurent and Brenda Liddiard will share their special blend of ‘acoustic music with passion’ at the Heritage New Zealand property in order to raise money for the St John Russell Health Shuttle." “We’re delighted to be able to host these two very talented musicians at Pompallier Mission on March 11 – which, coincidentally, also happens to be the anniversary date of the Battle of Kororareka,” says the Manager of Pompallier Mission, Scott Elliffe. Admission is $15 per adult, and children under 15 are free – tickets available through the Russell Bookshop or email dianesmith@hotmail.com (Wet weather venue – Supper Room, Russell Town Hall). Submitted by mark on Friday, December 11th, 2015 at 2:50 pm. "Every Christmas, Pompallier Mission and New Zealand’s oldest church, Russell’s Christ Church, come together to host community carols for locals and visitors alike. Local groups and soloists will perform traditional festive favourites as well as modern Christmas songs as part of the show, which takes place on Saturday December 19 at 6pm." Submitted by mark on Friday, November 28th, 2014 at 10:20 pm. Every Christmas, Pompallier Mission and New Zealand’s oldest church, Russell’s Christ Church, come together to host community carols for locals and visitors alike. Local groups and soloists will perform traditional festive favourites as well as modern Christmas songs as part of the show, which takes place on Saturday December 20 at 6pm. “Carols @ Pompallier is an annual fixture for the Russell community and is a great way for the community to re-connect and kick off the festive season,” says the Manager of Pompallier Mission, Scott Elliffe, who will be celebrating his first Christmas in the Bay of Islands this year.